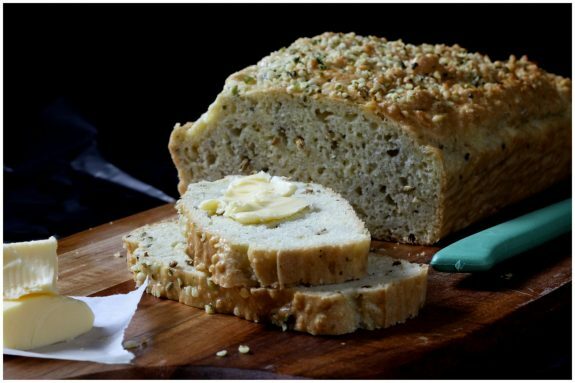 This wonderfully nourishing bread is dense and delicious. It’s gluten-free and grain-free too. Cheese can be omitted to make this a truly Paleo loaf. Today, as you’re reading this post, Mr Chipconnoisseur and I are driving down the I-5 on the West Coast of the United States headed down to San Diego. While I take this week off, I wanted to introduce you to Sherilyn, whose blog, Wholepromise I’ve been following for over a year now. Sherilyn Palmer is a Fertility Nurse/ Midwife, Certified Health Counsellor and Natural Fertility Educator specialising in PCOS health and well-being and fertility awareness education. Her blog showcases a collection of wholesome recipes created with a women’s health and well-being in mind. 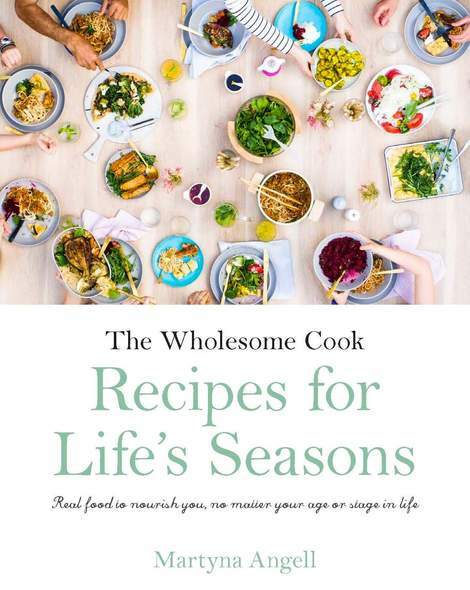 It is also a medium for her keen interest in food styling and photography and is really worth a paying a visit if you are into delicious, healthy recipes. 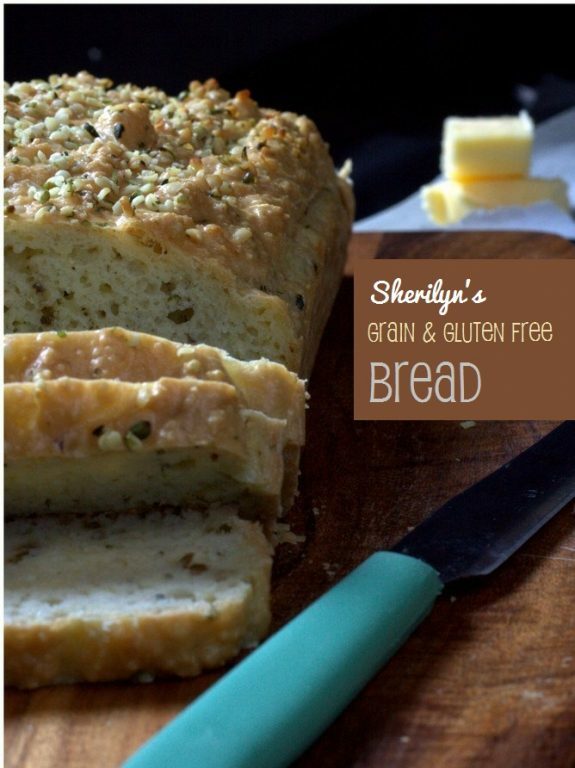 Sounds fabulous Sherilyn, I cannot wait to make this when we get back! Thank you for sharing your beautiful recipe and photography with my readers. 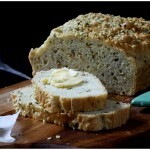 This Grain and Gluten Free Bread is made with hemp, almond meal and is spiced with fennel seeds. Makes 1 loaf. Place the almond flour, arrowroot flour, 1/4 cup hemp seeds, sea salt, baking soda, fennel seeds and cheese in a medium size bowl and mix together breaking up any lumps as you go. In a separate bowl, lightly beat the eggs and apple cider vinegar. Add the egg mix to the dry ingredients. Mix well to combine. Pour the mix into the prepared tin and sprinkle the top with the additional tablespoon of hemp (or ground pumpkin) seeds. Bake for 30 - 35 mins or until a skewer when inserted comes out clean. That looks very tasty and surprisingly bread like for grain free bread. Thanks for introducing us to a new blog. Thanks Sherilyn for a wonderful recipe. I am in love with almond flour and curious to try new stuffs. I am bookmarking this recipe. I love the bread, but can you suggest something else if you don’t have arrowroot powder? I have everything else! Thanks! Hi Jennifer – Thanks for the question. I haven’t tried this but I believe you could substitute equal quantities of cornstarch or potato starch. If cornstarch is used the bread would no longer be grain fee but would still certainly be gluten free. Would love to hear how you go. Hi Anne – it’s actually not a bad compromise for the real deal but not everyone would agree of course. It is worth trying none the less. This bread looks great. If I want to leave out the parmesan for a dairy-free version is there something I could add to replace it? Hi Cath, I have a feeling you could omit it out of the recipe but will confirm with Sherilyn for you. What a great recipe! Avocado sounds wonderful with it. Hope you are having a blast Martyna and I look forward to meeting you in Adelaide! A delicious looking loaf and wonderful guest post! Thank you for stopping by Rosa. Looks fabulous! Hmm…I wonder if there is a way to make it cheeseless and still have fabulously delicious results….Thanks for sharing!! I have a questions and a suggestion. What if for those looking to forgo the cheese you substituted nutritional yeast flakes? It would give it the parmesan flavor without the cheese. And my question is has anyone tried making this with flax eggs instead of eggs? Just curious how it turned out. Thanks and I love your blog! Hi Michele, thanks for the suggestion and question… Re: nutritional yeast flakes, I have not tried but if they can impart a cheesy flavour without cheese and would not change the consistency of the dough I can’t see why you couldn’t use them. As for flax instead of eggs, I have used it succesfully in mny recipes, including sponge so I think it may work here too. I tried it with the flax eggs and it worked! It needed a little longer cooking – I baked it for 45 minutes. Very tasty! How long does this last? is it the same as normal bread? do I need to store in the fridge? Hi Jaime, you can store it in the fridge, wrapped snugly in foil. It should last for up to 4 days. Hi Patricia, the temperatures are correct. Are you using Celcius or Fahrenheit? They are provided in both.